Why is DNA made out of deoxyribose and RNA made of ribose? Why can't they both use ribose or deoxyribose? I think that the deoxyribose gives an advantage in storing genes, the job of DNA and ribose is better dealt with outside the nucleus...but why? Nice question which leads to the fundamentals of DNA and RNA. DNA (Deoxyribonucleic acid) is the core of life in Earth, every known living organism is using DNA as their genetic backbone. DNA is so precious and vital to eukaryotes that its kept packaged in cell nucleus, its being copied but never removed because it never leaves the safety of nucleus. DNA directs all cell activity by delegating it to RNA. RNA (Ribonucleic acid ) have varied sort of biological roles in coding, decoding, regulation, and expression of genes. RNA carries messages out of the cell nucleus to cytoplasm. The structure of RNA nucleotides is very similar to that of DNA nucleotides, with the main difference being that the ribose sugar backbone in RNA has a hydroxyl (-OH) group that DNA does not. This gives DNA its name: DNA stands for deoxyribonucleic acid. Another minor difference is that DNA uses the base thymine (T) in place of uracil (U). Despite great structural similarities, DNA and RNA play very different roles from one another in modern cells. RNA is very unstable and decomposes rapidly. RNA is almost always single stranded. DNA and RNA use a ribose sugar as a main element of their chemical structures, ribose sugar used in DNA is deoxyribose, While RNA uses unmodified ribose sugar. From the fig above we can see that the principal difference between the two molecules is the presence of OH in ribose (2' tail) and absence in deoxyribose. 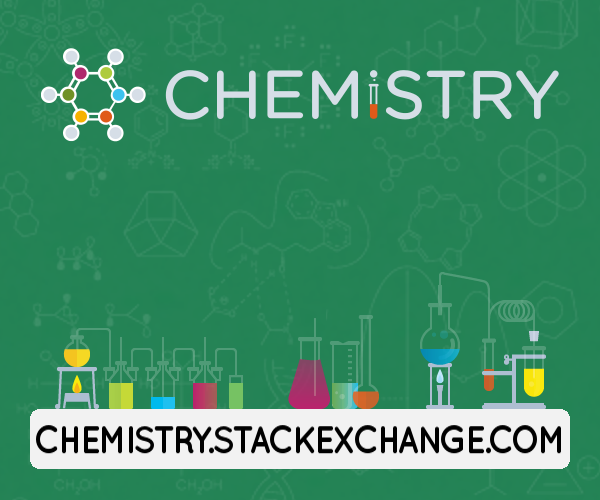 There is a difference in one Oxygen atom as the name stands de-oxy ribose. Both Ribose and deoxyribose have an Oxygen(O) atom and a Hydrogen (H) atom (an OH group) at their 3' sites. The OH groups are very reactive in nature, so the 3' OH tail is required for phosphodiester bonds to form between nucleotides in both ribose and deoxyribose atoms. DNA is such an important molecule so it must be protected from decomposition and further reactions. The absence of one Oxygen is the key for extending DNA's longevity. When the 2' Oxygen is absent in deoxyribose, the sugar molecule is less likely to get involved in chemical reactions( the aggressive nature of Oxygen in chemical reactions are famous). So by removing the Oxygen from deoxyribose molecule, DNA avoids being broken down. In an RNA's point of view the Oxygen is helpful, unlike DNA, RNA is a short-term tool used by the cell to send messages and manufacture proteins as a part of gene expression. Simply speaking mRNA (Messenger RNA) has the duties of turning genes ON and OFF, when a gene needed to be put ON mRNA is made and to keep it OFF the mRNA is removed. So the OH group in 2' is used to decompose the RNA quickly thereby making those affected genes in OFF state. 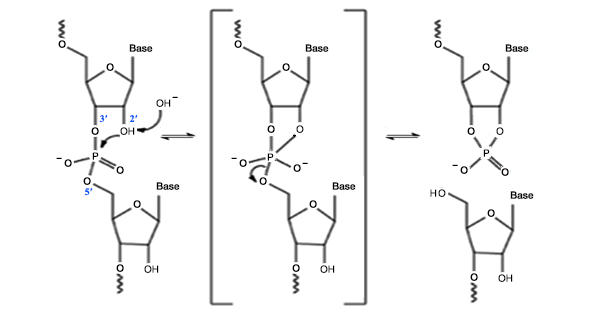 Finally, the ribose sugar is placed in RNA for easily decomposing it and DNA uses deoxyribose sugar for longevity. Addition to Jvrek's answer based on the comments. Most RNA degradation mechanisms catalysed by different RNAses (RNAse-A and RNAse-S, for example), involve the 2'-OH. Therefore the repertoire of RNAses is selective towards RNA and not DNA because of the 2'-OH. Why DNA for the genetic material? The primary advantage of DNA over RNA as a genetic material is the greater chemical stability of DNA, allowing much larger genomes based on DNA. To expand, RNA is unsuitable for large genomes because the 2'-OH of ribose (obviously absent from the 2'-dexoyribose of DNA) renders the phosphodiester bond susceptible to alkaline hydrolysis (see illustration adapted from Wikipedia article). This will occur slowly at pH 7.6, but at a rate calculated to be sufficient to degrade a 1000 nucleotide RNA in about 70 days. This explains why all RNA viruses have small genomes (and why some, like flu virus, are segmented). Why RNA for other informational functions? There are a variety of ad hoc arguments here, but none as conclusive as the argument above for DNA. This is partly because there are a variety of functions RNA performs — one can make different arguments for each. Before making a point that I don’t think has been made above, I would say that RNA most likely preceeded DNA (whether or not one believes it preceeded protein) and that there would have had to be a selective advantage for organisms to switch from RNA to DNA. One can see that for the genome, but not for the other functions. This argument also applies catalysis, but in a slightly different way. If RNA enzymes (ribozymes) preceeded protein enzymes, most ribozymes have been dumped because protein enzymes are more efficient and organisms which developed them were at an advantage. Those that are left are so intimately involved with RNA that replacement by proteins would have been difficult. So answers to this question about DNA not being able to replace catalytic RNA, though correct, seem to me peripheral the general question of RNA function. 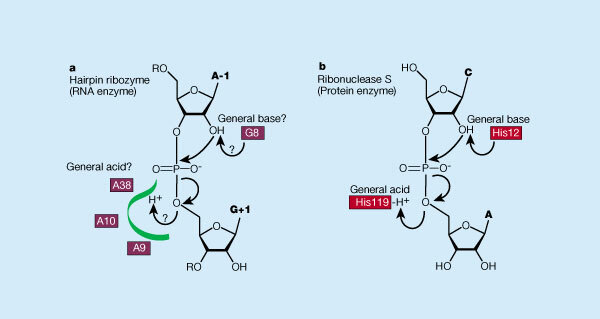 The presence of the ribose 2'-hydroxyl group in RNA engenders a preference for the C3'-endo puckering, thereby providing the decisive factor for the differences in conformation, hydration and thermodynamic stability between canonical RNA and DNA helices. Basically, it is because DNA is so hydrophobic that it does not substantially catalyse reactions in aqueous solutions. RNA is less hydrophobic and therefore more able to catalyse aqueous reactions, but the same reactivity means that it is more susceptible to degradation and so less suited than DNA to the storage of genes. RNA is more polar and therefore less hydrophobic than DNA because of the increased polarity of the extra hydroxyl group in ribose compared to deoxyribose. This means that DNA is more stable than RNA, because the strands are harder to separate because they are more attracted to each other than the surrounding water. Because it is more stable it is more suited to storing genetic sequences with less degradation than RNA. But because DNA is so stable it requires a substantial amount of machinery just to separate and keep separated the strands when they are needed. It is therefore unlikely DNA was the original genetic material that came about via much simpler prebiotic chemistry. RNA being more polar is easier to separate. It also unlike DNA can actually catalyse a wide variety of reactions requiring only the RNA and some prebiotic chemistry such as metallic ions or simple fatty acids. But being easier to separate RNA is more susceptible to degradation by aqueous reagents, and being less stable is less suited to the storage of genes without degradation. So if an organism found a way to turn its RNA to DNA for storage and back again it would have a significant selective advantage. Such a mechanism might be as simple as protein or ribozyme that could preferentially hold DNA in contact with RNA. Then the normal mechanisms of strand ligation could work both to produce DNA from RNA templates and RNA from DNA templates. Over time there would tend to arise specialised versions to do each task, but each building on the original holding mechanism, which itself could have built on the ligase mechanism. Today there are a number of highly related small DNA and RNA binding RNAs involved in many analogous processes. Search for RNA Structure, Function and Recognition by Anna Marie Pyle on iBioseminars. I would link some more, but I don't have the reputation. But see also "The Origin of the Genetic Code" by cdk007 in the same series. Also there is an excellent 3 videos on abiogenesis, RNA and fatty acid vesicle "protocells" by Jack Szostak on ibiology. Just search for them.